I love a good pan sauce. There's really nothing easier you can do to add flavor and moisture to whatever meat you're searing. 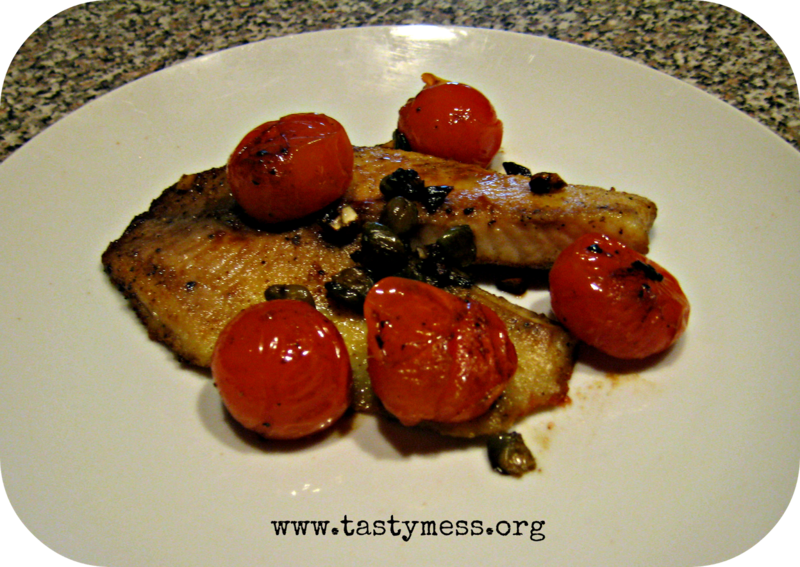 This time I put together a simple fresh tomato-based pan sauce to complement the tilapia I was searing. The simple combination of fresh cherry tomatoes, a few capers, garlic and balsamic vinegar really brightened up the fish and added a little more of an exciting component to the plate. Plus, we're getting into planting season here on the East Coast (finally!) and I can hardly wait for those fresh tomato flavors! You can easily swap in your favorite firm white fish for the tilapia in this recipe, I just happened to have tilapia instead of cod or halibut on hand. Combine the tomatoes, capers, balsamic vinegar, 1/2 tbsp. of the olive oil, garlic and a generous pinch of salt and pepper in a small bowl. Set aside. Heat the remaining olive oil and butter in a nonstick pan over medium-high heat. In the meantime, prepare the fish by generously seasoning with salt and pepper on both sides and lightly dusting with flour. Shake off the excess flour before adding the fish to the pan. Cook for 2-3 minutes on the first side, then flip and cook for another minute or two on the other side. Add a splash of white wine to the pan to de-glaze and scrape up any little bits of flavor on the bottom of the pan before adding the tomato mixture to the fish in the pan. Let it cook for 3-4 minutes on a slightly lower heat (so you don't overcook the fish) until the tomatoes are warm and starting to split open when you press on them with a spatula. Serve the fish hot, topped with the tomato mixture and a side of couscous.